Here is how you can bring your entertaining area back to life while reusing and recycling your broken furniture instead of throwing in landfill. It is easier to repair and revitalise your old and dull outdoor furniture, whilst being eco-friendly, than you may think. With a little bit of creativity you can transform your shabby pieces into the highlight of your entertaining area. Alfresco chairs are often cushioned and padded. As these are left in the elements, they tend to deteriorate faster than other pieces of furniture. You can repair these with ease by removing the old cushion cover and replacing with new fabrics. TIP: Cushion covers have the potential to brighten or mellow a room. Let the fabrics do their job and create an atmosphere that will have you embracing the outdoors. It is just as important to check the cushion padding to ensure it isn’t mouldy. If this is the case, find a cushion of the same or similar size to exchange it with. Depending on the materials of the frame, give chairs a quick sand to smooth them out and eliminate any potential splinters. Add a fresh coat of paint, stain or sealant to finish the job. Pallets are right on trend at the moment and as they are so versatile they will be here to stay! Businesses have used pallets for storing, loading and stacking goods in warehouses and building sites for what seems like forever. Creative up-cyclers have now made it a design feature to create furniture and outdoor features with them, and the possibilities are endless! Sand the pallets back and give them a coat of lacquer or paint according to what you want to make with them and the style you are trying to achieve. You can repurpose your old pallets into beds, outdoor lounge chairs, vegetable garden beds, wall art, and the list goes on. 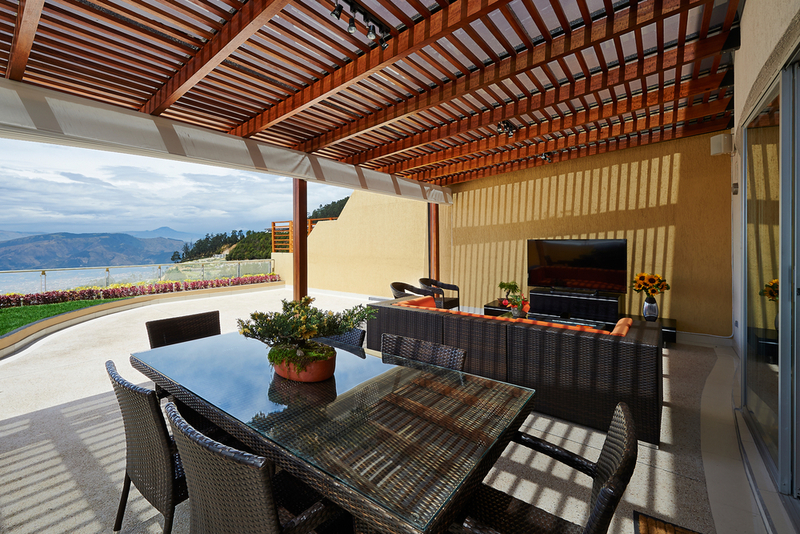 To create an outdoor lounge, once the paint has dried, screw the wood into place to make the lounge shape you desire. Place it against a wall, size up the cushions for the base and ensure there are enough pillows to use as backrests. Now your couch is complete! The benefit old wrought iron legged tables and chairs have is it doesn’t matter if the top is iron, metal, glass or wood. All of these materials can be easily spruced up to add flare. This is your chance to make a statement piece in only a few steps! • Remove the old paint and rust with an abrasive sanding pad. Ensure there are no loose flakes as you want the new paint to stick properly. • Apply two coats of primer to the wrought iron and allow to dry for a minimum of 24 hours. • Spray with your chosen paint colour. For best results, spray several light coats so there will be no dripping. Let it dry for 24 hours. This new upcycled piece will add a contemporary style to your alfresco and show off your personality. Choose a bright and effective colour to showcase this! Like anything wood that is left in the fluctuating weather, these will require some restoration to bring them back to former glory. Luckily, wooden tables are extremely simple to work with and you can easily accomplish a fresh appearance. Simply sand back all the loose pieces of wood and round off the corners to reduce the risk of splinters. Add a few coats of stain in your desired colour, allowing the table to dry between each coat. TIP: Long, even strokes with the grain will ensure your wood will look its best! Making the most of the furniture you already have doesn’t mean you have to be happy with the current state it is in. You can improve the atmosphere of your alfresco area by making a few simple upcycling decisions. Be a friend to the environment and save yourself a lot of unnecessary spending by trying an outdoor furniture repair before throwing it away and replacing it. You will be surprised at how easy and effective these simple DIY ideas can be! For any outdoor furniture repair or upholstery needs that you cannot achieve alone, contact the team at Lounge Repair Guys on 1300 101 510!